Music is such a powerful primary source and can really help us connect to and engage with a person or an event. The Library of Congress is full of digital music resources, including numerous sheet music collections and items. But what to do if you would like to hear the music but cannot play an instrument yourself? Well, finally, there’s an app for that! Thanks to Library of Congress Teacher in Residence Tom Bober for uncovering this wonderful tool! Currently the Sheet Music Scanner app is only for iOS devices such as iPhones and iPads and it’s not free, but it is under $5. The Sheet Music Scanner lets you choose from 21 different instruments for music playback, including piano, flute, guitar, and violin. You can adjust the beats per minute and the pitch as well. You can play the music right in the app. After, you can export a MIDI file, which is a data file, so you would need to convert it to a sound file (e.g., .wav or .mp3). The app doesn’t work perfectly every time but it is good enough to give you a sense of the music. The developer, David Zemsky, has a support and FAQ page on his website and also invites users to contact him. Listen to a recording of the first page of the 1919 fox trot song “Shrapnel Blues” made using Sheet Music Scanner. 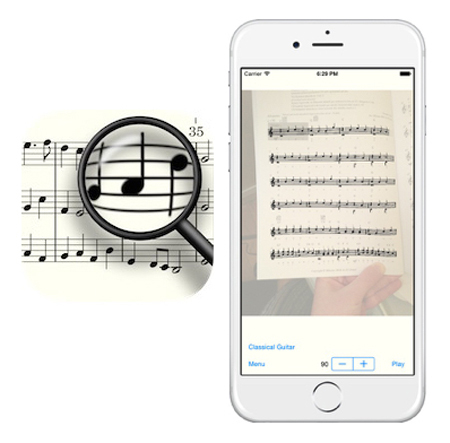 Locate a piece of sheet music from the Library’s collections on your iOS device. Save each sheet as an image file (note: most sheet music contains more than one page). Open the Sheet Music Scanner app. Click Scan and Play, then Choose from existing (images). Locate the image file and select it. Wait for the app to do it’s magic. After, you can change the BPS (beats per minute) or the instrument. Click Export to MIDI at top left. Enter a file name and select a location (e.g., iCloud, Google Drive, etc.). Use an online file conversion service (or GarageBand and iTunes) to convert the file from MIDI to a sound file such as .mp3. Use an online audio editing program, such as Audacity (free) to stitch the sound files together into a complete song.